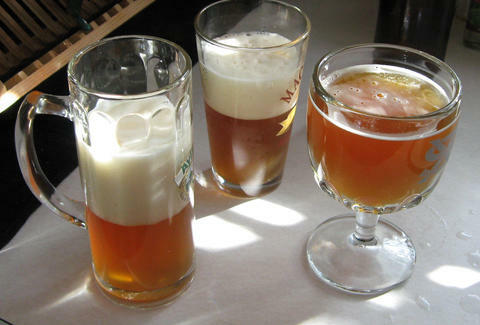 Many good beers have been lost due to excessive foam. Sometimes your buddy just messed up the pour, but other times your brew rebels the second you pop the cap. Luckily, Belgian scientists have been conducting important research into this matter, and just found out that magnets can control the head of your beer. As the astute minds at The Atlantic explain, beer overflow is mostly caused by a protein called hydrophobin. Hydrophobins have a pesky habit of attracting carbon dioxide molecules, and when too many of those form around the neck of your beer, you're bound to get hosed. Hops can help prevent hydrophobins from binding with carbon dioxide (and thus triggering a sudsy eruption), but even with hops in play, your beer can still run over without warning. So a team of scientists went to Orval Brewery and experimented on a fresh batch of beer to see if they could manipulate those stupid proteins. What they discovered was that passing the suds through a glass tube with a magnet wrapped around it caused the hops to spread more evenly throughout the batch. That prompted them to bind with more hydrophobins, which drastically cut down on the foam. And it only took a minute to see the change. While we still can't really explain to ICP how magnets work, at least now we know they produce great results. Kristin Hunt is a Food/Drink staff writer for Thrillist, and thinks Juggalos might be even scarier than clowns. Follow her to hiding places at @kristin_hunt.